Don Burleson Blog: Where is Jethro Bodine (Max Baer Jr.) Today? Where is Jethro Bodine (Max Baer Jr.) Today? 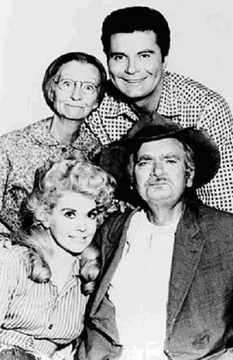 Any child of the 1960’s remembers the hit TV show “The Beverly Hillbillies”, a precursor to the Bel Arabs, whereby a good ole boy (Jed Clampett) becomes a millionaire. This was the heyday of the “Hillbilly” Genre started by Barney Google and Snuffy Smith and popularized by Lil Abner. One of the start of the Beverly Hillbillies was a Lil Abner lookalike called Jethro Bodine, who just happened to be the son of the world’s most famous Jewish Heavyweight fighter of all time, Max Baer. According to this article, Max Baer Jr. has been speculating in the Beverly Hillbillies market, starting a Beverly Hillbillies theme casino in Carson City Nevada! His Dad, Max Baer Sr., was the Jewish pugilist from the hit movie Cinderella Man, starring Russell Crowe, the phone-throwing actor. However, it was Max Baer Jr. who became the real household name, starring as Jethro Bodine in the Beverly Hillbillies. Derogatory airline lingo - Shamu’s aboard! The origin of the word "faker"
Mexico planning to invade USA?